I just got mine last month and only paid $43 per for them but I can't remember the web site, it was recommended on here somewhere in a CCT thread. Really fast shipping altho they were out of stock when I ordered mine. 33,000 on the OEM's. Thanks for the help. If anyone could come up with a website for APE, it would be greatly appreciated. Can't find one in google, except from Europe. If anyone could come up with a website for APE, it would be greatly appreciated. The crbzone link is an APE website, too. Actually, when I bought mine a few years ago I found them cheaper at a dealer's website, but I can't remember for the life of me what that site was. Prices have gone up a bit since then and I doubt that deal still exists anyway. My brother and I replaced mine last Wednesday. Followed the posted info. and we were good to go....pretty easy. I also kinda did what viperkillertt did, i.e. 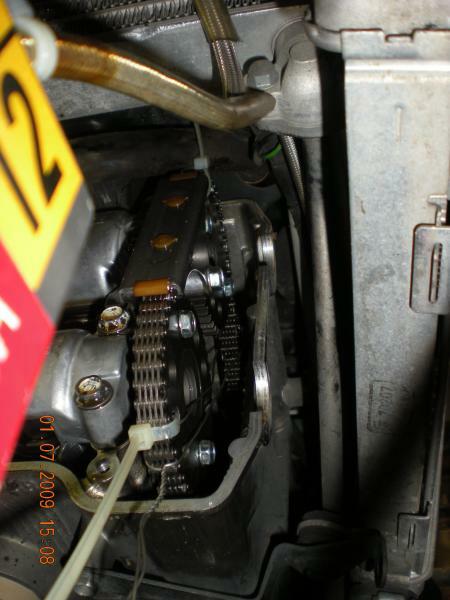 pulling the cc prior to removing the tensioner. We used safety wire. Big Thanks to Calitoz for a great right up ! At 14k ...I finally replaced mine today . By carefully following your directions it was a successful swap . However I did go ahead and remove the front valve cover just to verify FT compression even though it wasnt necessary , I just wanted to be sure ! Replaced the OEM CCT's with a set of manuals from Trucinduc and the process to remove and install is very easy following Calitoz's write-up. It took me approximately 2 hours from start to finish, including removing the rear cam cover to insure I was a TDC. The key to success is when you loosen the CCT gasket, gently remove the OEM and you will be 100% sure the chain will remain in place. I also removed the spark plugs to make turning the crank easier. I too just installed a set from Truck. 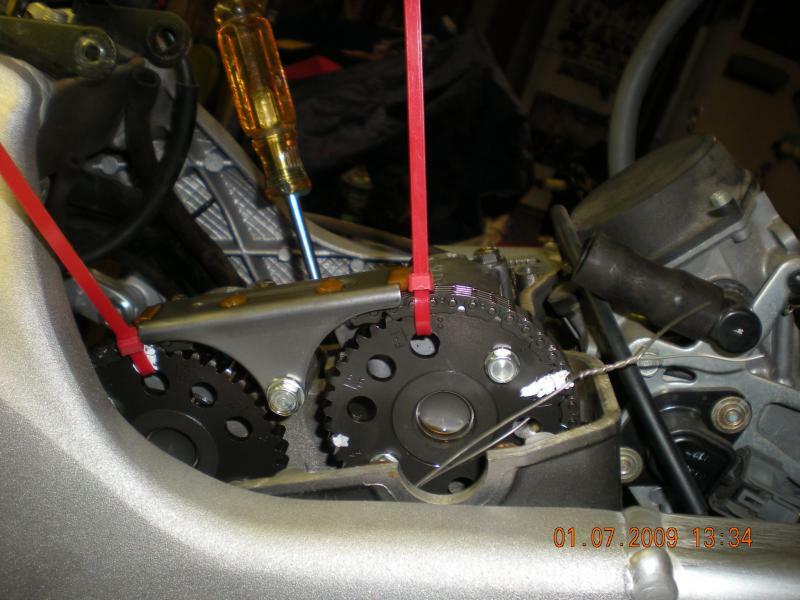 After removing the rear cover to align timing mark and cams, the front requires 450 degrees of counter clockwise rotation (1 1/4 turn) to be on the marks. Believe me, you don't need the hassle of removing the front head cover. Just did mine yesterday, used the tips in this thread, and it went seamlessly. Makes you realize how valuable these forums are. Thanks to all who posted their experience in here, lots of great info. Ok, got a question. when the front is on the mark, are the cam marks sometimes half a tooth off? the lobes look like they're in the proper place, just the marks are slightly off. if I were to move the cam sprocket forward one notch, they'd be below the edge half a tooth instead of above it half tooth. Did mine today with Trucker's CCTs. Took just short of three hours, start to finish. All went well. Only removed the rear spark plug. It held at TDC for the front no problem. With warmer weather coming this week, I'll feel a lot more secure when riding. guess I was looking at mine a little crooked. was ok, and just got back from a testride. running excellent. I have a stupid question. Why 6th gear? Update: Dont read this post from me. I was not understanding the question Sorry. Umm, i personally use 6th gear almost daily. I really dont understand your question. Our bikes have tons of torque, so 6th gear is a great gear to cruise in on the freeway. I can go from 70-90 in 6th within like 3 seconds. Very helpful to pass cars quickly and then return to the speed limit. Last edited by viperkillertt; 05-19-2009 at 08:46 PM. 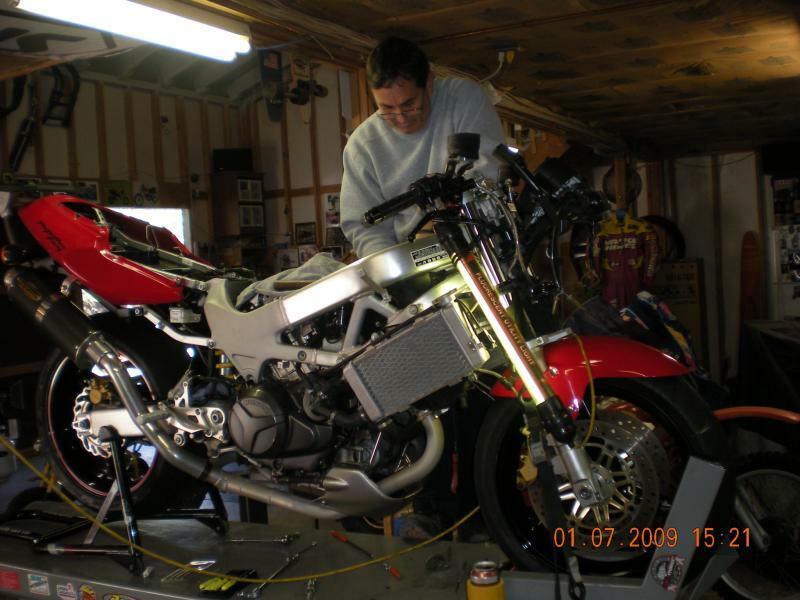 Step 1: Put the Hawk on a Center stand that will allow you to rotate the rear wheel. Step 2: Remove the Timing hole nut (Left side of the hawk-nut to the left) and locate the "RT" mark . This is done by putting the Hawk in 6th gear (thanks nuhawk and slowhawk) and move the rear wheel until the "RT" mark is aligned with the mark on the casing. When the marks are aligned, the TDC (Top Dead Center) is reached for the rear cylinder. If you actually READ the the instructions you might understand my question and not give a stupid answer. Maybe I should have asked the question better but at 6am I'm not always thinking clearly. Thank you. That's what I thought, I wanted to make sure it didn't have a different purpose. I just ordered my tensioners and they should be here Friday. This has to be the best thread yet. Awsome job with the step-by-step. OMG!!! I finally got it. Sorry, i was so confused. I have been posting to this thread for 2 years, so i didn't re read the beginning. I will agree that a socket wrench is far easier than the tire method. You can use the back end of the stock spark plug wrench to remove the access cover, then a large socket wrench to turn the motor. Wow, i didnt know about the back of the spark plug wrench. That is cool. Mine was stripped quite a while ago, so i need a new one before i can use it. Thank though. The cover is a 10mm allen wrench, I tried my T-handle Snap-on first, no go. Then a 3/8 long handle ratchet with an allen socket, and finally stripped the threads out with a 1/2 breaker bar. Any ideas on getting it out? Impact driver? Edit: Also tried my electric impact and it wouldn't budge it. Last edited by Syclone; 05-20-2009 at 12:15 PM. Wow, it sounds like what i did. I used a star socket from craftsman. I pounded it into the slot with a mallet and then i was able to get it off. It is nice to not be the only one who stripped it. I kinda wish they offered a stainless steel version. I am sure this is a common issue. Also, make sure to not put it on very tight when you replace it. Good luck! Also be very careful if you use my method. You could easily hurt something if not careful. I/we figured Honda would have included a tool to remove it in the tool kit, so that is how we figured out the spark plug wrench thing (it was either yruyur or I who figured it out, we both did our APEs at the same time), it fits deeply and securly and by putting the 10mm wrench on there first you have a nice handle that you can put a breaker bar onto. Last edited by lazn; 05-20-2009 at 12:57 PM. I turned out the 10mm hex too. The cover plug was seized in. You need to use a thin chisel, and use this to 'crack' the seized threads by (carefully, you don't want to hit the stator cover) tapping the plug anticlockwise. Wish i'd done that before stripping out the hex socket in the middle. New plugs are pretty expensive. On reinstalling, use a smear of copper grease on it, and the timing hole plug. Last edited by opsmgr; 06-01-2009 at 05:59 AM.